At a young age, Kayla Jones became the parent in her life. With an alcoholic mother and a father who was always away, no one was there to provide the structure she needed. She frequently missed school and fell behind when she was in class. It became a vicious cycle: the more school missed, the more she fell behind, and the more overwhelmed she was with what it would take to catch up. Yet, the school kept pushing her onto the next grade, where she fell further behind. Seeing no hope to the situation, Kayla began to skip school. Family members tried to intervene, even the Juvenile Office, but she kept getting worse. Finally, as things deteriorated at home, an aunt knowing of Show-Me from her local church reached out for help. She arrived on campus the end of her 8th grade year. At age 14, she started her education program at Show-Me testing at a 3rd grade level in most of her subjects. The school allowed her to learn at her pace and master the foundational elements that she never understood. A new cycle began: she completed subject after subject. With each accomplishment a new confidence and determination grew inside her. Over the next four years, she went at a record pace to pass the equivalent of nine grades and receive her high school diploma. After high school, she left Show-Me to attend nursing college in the Jefferson City area. Life outside the structure and routine of Show-Me was not easy. She connected with old friends and began to fall into old routines. At age 18, she became pregnant and got married. Kayla was determined to finish her degree. Her husband worked alternating shifts so that they had child care while she was in class. She graduated from Lincoln University in 2012 and received the Helen Moore award, one of the college’s highest honors given to the student that exemplifies the best qualities of a nurse. 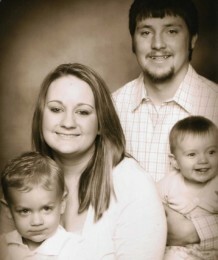 Kayla and her husband still live in Jefferson City with their three children. She works as an Intensive Care Nurse at a local hospital. For Kayla, there was no specific event that was a turning point in her life, there was a place. Show-Me helped Kayla and her family to see her through God’s eyes as the success she was created to be. Helping others to see through those eyes has become her mission.